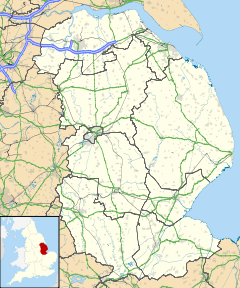 Thurlby is a village and civil parish in the South Kesteven district of Lincolnshire, England. It is situated just west of the A15 road, 2 miles (3 km) south from the town of Bourne, and on the edge of the Lincolnshire Fens. It is sometimes referred to as Thurlby by Bourne to distinguish it from other villages in Lincolnshire with the same name. Thurlby and the hamlet of Northorpe to its north are conjoined. The parish had a population of 2,136 at the 2001 census, although this had increased to 2,153 at the 2011 census. The Roman Car Dyke passes through the parish to the east of the road. The A15 road itself broadly follows the route of the Roman Road King street. The church of St Firmin dates back to before the Norman Conquest, reportedly to 925 AD. It has features of Saxo-Norman and Perpendicular style. Thurlby is mentioned in the 1086 Domesday survey as "Tvrolvebi", "Tvrodldbi", "Torulfbi" and "Turoluebi". A Methodist chapel, Trinity Methodist Church, was established in 1912. Thurlby railway station was on the Bourne and Essendine railway; it opened in 1860 and closed in 1951.The railway workers cottages 3 to 9 Station Road, built in 1866 are nearly the oldest properties in the village, they were famously hit by an air bus in the 1920s. Geographically Thurlby is on the western edge of The Lincolnshire Fens, and Thurlby Fen, to the east of the A15, falls within the drainage area of the Welland and Deepings Internal Drainage Board. Thurlby lies between Bourne and Baston. Most of the village lies to the west of the A15 road but a part, including the parish church, is to the east. The parish includes Northorpe, which is continuous with Thurlby, and the outlying hamlets of Obthorpe and Kate's Bridge. The ecclesiastical parish of Thurlby shares the same boundaries as the civil parish. The ecclesiastical parish, with a single parish church of St Firmin, is part of the Ness group of the Deanery of Aveland and Ness with Stamford. The incumbent is Rev Canon Janet M Beadle. There is one public house, the Horseshoe, located on the A15 and High street junction. Thurlby also contains a renovated shop with a post office, and a veterinary practice. A firm of agricultural engineers, a furniture store, and a petrol station operate in Kate's Bridge, about 0.5 miles (0.8 km) from the village. In 1979 local resident Harold Sneath bequeathed his home to the Youth Hostels Association (YHA) to use as youth hostel. Following the 2001 foot and mouth crisis the YHA looked to close the hostel to reduce costs. Lincolnshire County Council and South Kesteven District Council were opposed to the closure and resolution was achieved by the two councils buying the building and leasing it back to YHA. The signpost for Thurlby now shows the YHA logo reflecting the ownership of the hostel. Northorpe and Thurlby are served by half-hourly Delaine buses between Bourne, Lincolnshire, and Peterborough, Cambridgeshire, and a daily service to Stamford, Lincolnshire. Plans for these buses to go through the villages of Thurlby and Northorpe and not just along the A15 are being considered. The nearest airport to the village is East Midlands Airport, about an hour away by car, situated in the neighbouring county of Leicestershire, with regular flights across Europe, North Africa and the Middle East. The nearest railway stations are situated at either Stamford and Peterborough, with both hosting regular scheduled services to London King's Cross and Birmingham, and Peterborough additionally connecting to other destinations throughout the UK, such as Norwich, Cambridge, Edinburgh, York, Newcastle, Lincoln, Nottingham and Doncaster. The village has a modern primary school sharing a site with the community hall and Lawrance Park. Thurlby Community Primary School usually has around 200 pupils and caters for children aged 4 to 11, with the majority of pupils progressing to either Bourne Grammar School or Bourne Academy. There is a pre-school is situated towards the A15 in Northorpe. The Thurlby 10 km Road Race and the 3 km Fun Run is organized each year by a group of volunteers, with hundreds of runners taking part. The races are usually held on the first Sunday in July. Lawrance Park (grid reference TF 095 170) comprises a community hall, park and children's play area. It is a sporting venue for the village, with many events taking place both in the hall (circuit training, indoor bowls, Taekwondo and line dancing) and on the park (football and school games). Thurlby has two football teams: the junior side, Thurlby Tigers, and the men's side, Thurlby United. Both sides play home fixtures at Lawrance Park. Thurlby also has a small tennis club. Car boot sales take place at Lawrance Park twice a year, at the end of March and at the end of September. They regularly attract over a hundred stalls and more than a thousand visitors from across the South Lincolnshire region. Northorpe is a hamlet situated directly adjacent to the village of Thurlby. Northorpe is near to Elsea and Math Woods, the latter of which is rumoured to be haunted by Nanny Rutt. The hamlet also has a post box and a telephone box. ^ "Civil Parish population 2011". Neighbourhood Statistics. Office for National Statistics. Retrieved 2 June 2016. ^ a b "St Firmin's church web site". Archived from the original on 10 December 2008. ^ a b Historic England. "St Firmin's (350407)". PastScape. Retrieved 13 July 2010. ^ Historic England. "Station site (507095)". PastScape. Retrieved 13 July 2010. ^ "Welland and Deepings IDB". ^ "Primary school web site". Archived from the original on 25 October 2005. ^ "Thurlby Run web site". Archived from the original on 24 February 2009. ^ "Thurlby Tigers web site". Archived from the original on 18 July 2012. ^ Codd, Daniel (2007). Mysterious Lincolnshire. Breedon Books. p. 95. ISBN 9781859835630. Noble, Majorie, ed. (1987). Thurlby: an ordinary village. Bourne: Warners. ISBN 0-9512386-0-4. John Morris, Domesday Book Lincolnshire, Phillimore, Chichester, 1986. ISBN 0-850335981. This page was last edited on 8 November 2018, at 12:33 (UTC).